Thangjiam Manorama Devi was a Manipuri village girl who was brutally tortured and subjected to gruesome sexual violence before she was killed by a team of the para-military force Assam Rifles in 2004. The incident caused widespread outrage and anger and sparked public protest leading to a judicial inquiry into the matter. The report of the inquiry was never made public until this year when the Supreme Court of India asked for it in connection with hearing on a PIL seeking probe into custodial deaths in the north-east States. The report exposes the Assam Rifles efforts to cover up the incident by lodging false FIRs and trying to avoid inquiry by unjustifiably invoking the Armed Forces (Special Power) Act, 1958. 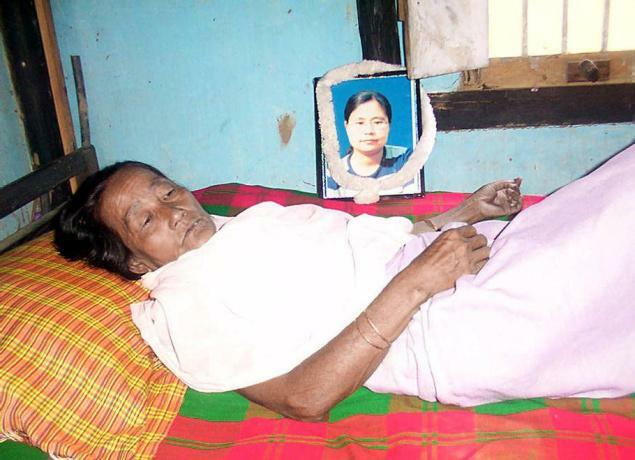 Thangjam Khuman Leima Devi, mother of Thangjam Manorama, at her residence in Imphal in 2004. She was found dead with multiple gun shot injuries on her private parts and thighs at Ngariyan Yairipok Road, hardly two km away from a police station, states the report. The judicial inquiry report on the murder of Thangjam Manorama, a Manipuri girl, in 2004, handed over to the Supreme Court recently after being kept under wraps for over a decade, reveals the “brutal and merciless torture” by a 17 Assam Rifles team. The murder gave renewed impetus to calls for withdrawal of the Armed Forces (Special Powers) Act. After a decade of remaining under wraps, the report by the Judicial Inquiry Commission graphically reveals the last hours of “brutal and merciless torture” Manipuri village girl, Thangjam Manorama, suffered at the hands of a team from the 17th Assam Rifles before she was shot dead. The Manorama case led to widespread protests against the Armed Forces (Special Powers) Act (AFSPA) and spurred calls for a review of the law, especially by the Justice J.S. Verma Committee in 2013. The report, submitted to the State government way back in December 2004, was never made public. This week, the government handed it over to the Supreme Court. The court had demanded it as part of a hearing on a PIL seeking probe into custodial deaths in the north-east States. “This is one of the most shocking custodial killing of a Manipuri village girl,” C. Upendra Singh, retired District and Sessions Judge, Manipur, who was Chairman of the Commission, wrote. He describes how Manorama was picked up by “a strong-armed troops of 17th Assam Rifles” in the night between July 10-11, 2004 from her home in Imphal East District. She was found dead with multiple gun shot injuries on her private parts and thighs at Ngariyan Yairipok Road, hardly two km away from a police station. The report details how the incidents of the night started with her younger brother, Thangjam Basu, watching the Hindi film Raju Chacha half past midnight, heard some noise outside. Within the next few minutes, the Assam Rifles party crashed into the house. The report said that Manorama, who was “clutching on to her mother Khumaleima”, was dragged out screaming “Ima Ima Khamu (mother, mother please stop them)”. The report said she was tortured on her front porch, as the family watched. It said how Basu remembers hearing his sister’s “muffled and dimmed voice saying Ie Khangde (do not know)” to the troops’ questions. It said the men then took her away to “places”. The report said that the two FIRs filed by the 17th Assam Rifles claimed she led them to recover Kenwood and Chinese grenades and an AK 47 rifle. It said she tried to escape and was shot in the legs. The FIRs claimed she had bled and died. The Commission report blamed the police for leaving the investigation to the “discretion and mercy” of the Assam Rifles. It narrated how the Assam Rifles had invoked the AFSPA with the Enquiry Commission. Mr. Singh said he countered that his enquiry was only a fact-finding exercise, and sanction under Section 6 of AFSPA would only come later when the personnel is found to have done wrong. The report said most of the injuries would reveal that she was shot when “helpless”. It said some injuries suggest sexual assault too. The Commission had examined 37 witnesses. Download full text of the report here. This entry was posted on November 29, 2014 at 6:49 pm and is filed under Custodial death, Encounter Killings, Extra-judicial execution, Report, Torture, Violence Against Women. You can follow any responses to this entry through the RSS 2.0 feed. Both comments and pings are currently closed.